This month we root for Renu and her sewing circle for the #WATWB positive story, trying to make a small change, spreading optimism, and dispelling negativity. In this edition of We Are The World Blogfest, I am sharing about a project that strives to enable underprivileged women and children. 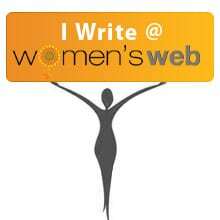 Bloggers are joining together for a cause: supporting the Project Why Women’s Centre at Madanpur Khadar, New Delhi via the Giving Tuesday Initiative, a global giving movement. Project Why provides after-school support to underprivileged children, and also works on women’s empowerment, so they can support themselves and their children. Since 2007, over a 1000 women have been trained at the women’s centre sewing circle, including Renu, the sewing teacher. Six years ago, when she joined Project Why, Renu had lost her home and incurred huge debts. Her husband got retrenched after an incapacitating work accident. After joining the Project Why sewing class, she started taking small jobs at home. She then grew into the role of the sewing teacher and began taking pride in her students. She is now paying back her debts and knows that she holds the key to her future in her hands. Her children study at the after-school support classes run by Project Why. Today Renu is looking at developing the skills of her students through a six-month programme. This will enable them to find employment in the garment industry. Women are true agents of change and helping them find the means to earn a livelihood would go a long way in transforming the lives of their families. At Project Why, Renu and her students not only practice sewing but also learn to read and write. When women are empowered, domestic violence drops, and the next generations finds access to better education. Your donation is 50% tax deductible under section 80G, and the entire expense account would be put up on the Project Why website once the amount is raised. Join the Project Why family by supporting Renu, so she can help women like herself. No amount is too small, and every little bit would help make Renu’s dreams become a reality! Project WHY is a flagship program of Sri Ram Goburdhun Charitable Trust, that provides educational support to underprivileged children. This after-school support program goes beyond academics, to include life skills and all-around development. Project WHY also runs vocational skill programs for women from underprivileged homes. Every year this nonprofit reaches out to 1200 children and 160 women. Since 2007, over a 1000 women have been trained at the Project Why Sewing Circle. Your co-hosts for this month are: Eric Lahti, Inderpreet Uppal, Shilpa Garg, Peter Nena, Damyanti Biswas Please link to them in your WATWB posts and go say hi! 5. Help us spread the word on social media. Feel free to tweet, share using the #WATWB hastag to help us trend! Tweets, Facebook shares, Pins, Instagram, G+ shares using the #WATWB hashtag through the month most welcome. We’ll try and follow and share all those who post on the #WATWB hashtag, and we encourage you to do the same. Have your followers click here to enter their link and join us! Bigger the #WATWB group each month, more the joy! Thank you so much Inderpreet for your support and help. It means the world to us. Hope to see you at Project Why. Project Why is one of the best things happening on earth. I first heard about it through Damyanti Biswas. It makes positive impact in our world. Thank you for sharing these benevolent acts with us. Great initiative! May it continue to spread far and wide. Thank you Indepreet! I have become very fond of this NGO ever since Damyanti introduced me to it. Thank you for sharing their intiative for raising money for Renu and her Sewing circle. Subscribe now to get updates in your email whenever I post something new!